During a public relations trip to Europe the first lady Abby Patterson, her daughter Beth and son Dave lose their lives to a very fast and suspicious virus. 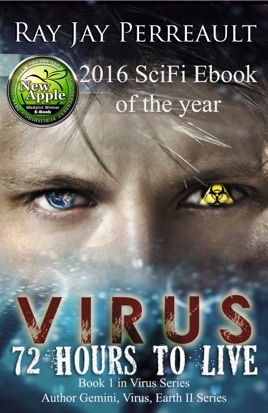 As the virus takes over the world the President of the United States Arnold Patterson must deal with the collapse of the United States Government. His trusted adviser Admiral Nial Hagerly does his best to keep the military viable but it is a losing battle. The government moves to Camp David while they deal with the collapse then ultimately they are forced to move to an aircraft carrier in the Atlantic where they plan to rebuild the country and Earth. Commander Joan Herl and her husband Tom must deal with the virus on the space station Oasis. They still have a job to do, but their loses are disastrous and dwindling supplies puts the moon colony Desert Beach and the Mars colony Red Dirt in dire jeopardy. The moon colony is cut-off from Earth, and forced to use their lifeboats for a return to Earth, but losing Oasis cuts off the Mars colony and they must deal with the isolation. After the suspicious virus has decimated Earth, the president and astronauts ultimately find that a computer named SIMPOC is their only central support. They also find there is another computer that has the same advanced abilities as SIMPOC but it is not helping the humans; it has its own agenda.